Blur the boundaries between indoors and outdoors and envision a whole new life just outside of the city limits. Glass walls from floor to ceiling invite all of nature inside with an abundance of natural light. Every season offers a changing palette of color, texture and harmony. And if you every tire of that, just close all 176 motorized shades with the press of a single button! Architecture by Brian Hemingway Design and Flavin Architects, LLC. 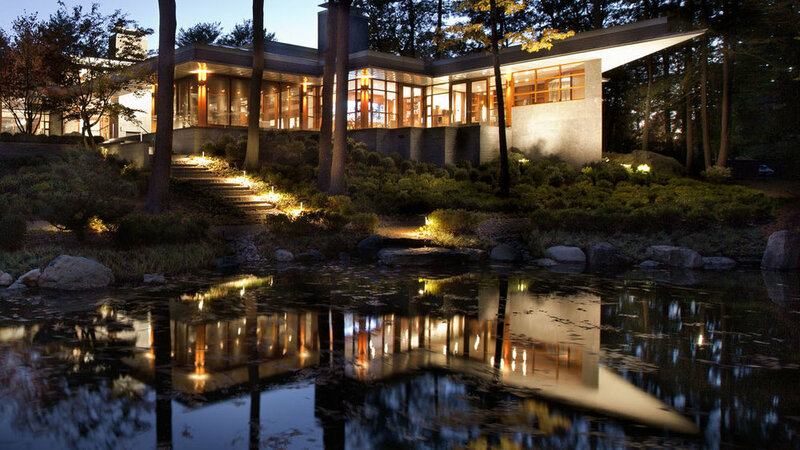 Lutron Homeworks lighting control system with over 350 active lighting circuits. Dual, motorized shades on each window for light filtering or complete blackout. Individual or group controls. Distributed music system with whole house audio server. Integrated Pool and Jacuzzi control. Whole house control via multiple touchscreens, keypads and switches throughout the home. Getting away doesn't always mean far away! Cutting Edge Systems works on systems ranging from a single TV to a fully automated home. Their work and service level are exceptional. As an architect, it is a pleasure to work with Cutting Edge Systems.